Atlantico 84. 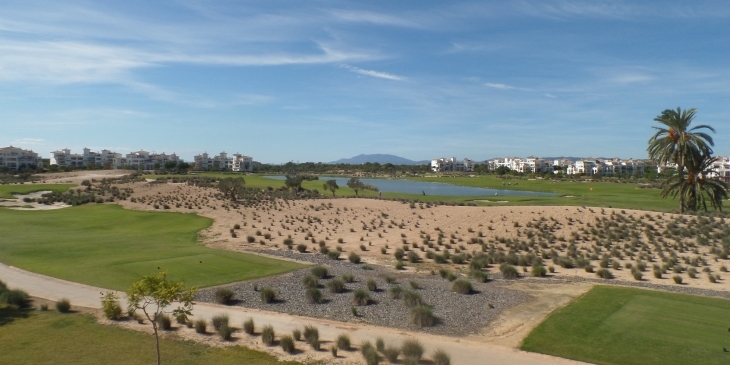 Beautiful penthouse apartment overlooking swimming pool and the par 5 14th and par 3 15th hole. The Penthouse Apartment Has Stunning Views Of The Golf Course. 1 Minute To Children’s Play Area. 2 Minutes From The Sports Area And 10 Minutes Walk To The Town Centre Bar, Restaurant. The Swimming Pool Is The Largest Pool On The Resort. The Village Of Sucina Is Is Just A 2 Minute Drive Away And The Fabulous Beaches Of The Mar Menor Just A 15 Minute Drive. Murcia City Is Just 25 Minutes Away. The Apartment Is Ideal For Golfers And Families Just Wanting A Relaxing Holiday. The apartment is well furnished. It has internet availability and has over 300 digital TV channels including UK free view channels. The apartment overlooks the largest swimming pool on site The bedroom balcony’s overlook the orange groves and the children’s play area. The resort boast a Nicklaus designed 18 hole golf course which holds regular professional tournaments. Further Information The city of Murcia is just 25 minutes away and boast a fabulous cathedral of architectural beauty. The local village of Sucina is just a 2 minute drive. The on site facilities include bar, restaurant, supermarket, 18 hole golf course and sports facilities. There are many beaches for sunbathing, swimming and water sports. The local village has many bars and restaurants. This is a fabulous place for family holidays and golfing holidays.